It is bad enough when you have a marketing agent that does not know what he is talking about. It is even worse when he cannot even sell to the right audience. This was what the wife and I encountered when we visited the sales gallery for VERDANA VILLAS yesterday. Him: Welcome to Verdana Villas! Looking for a house for own-stay or investment? Him: Then Verdana is the best choice. Our houses are much lower priced compared to the $4 - 6 million you have to pay for similar cluster-house projects in Lornie Road. Me: But Lornie Road is like District 11, whereas you are District 19. So it’s not exactly “apple to apple” is it? Him: Your children are studying? You know, we are located near very good schools like the French School, Australian School…. Me: Er…. We are buying for our own-stay, and we are neither Australian nor French. So what good are these schools to us even if they are right next door? Humour aside, VERDANA VILLAS is a freehold cluster housing project located at Grace Walk, off Lorong Chuan. It sits on a long strip of land of about 104,000sqft, and consists of 54 units of cluster Semi-D and 2 units of Bungalows. The vehicle entrance into VERDANA VILLAS is via Grace Walk, while vehicle will exit into Lorong Chuan. There will also be two side-gates located along Grace Walk for those on foot. All villas have five floors – basement, ground, second, third and roof terrace. The expected TOP of this project is in December 2014. VERDANA VILLAS is developed by the Novelty Group. For the uninitiated, Novelty Group is a mid-sized developer that is responsible for several medium to high-end projects like Lucida (Suffolk Road), Iridium (Newton), Luma (St. Thomas Walk) and the infamous Amanusa (Yio Chu Kang Road) - where Novelty was taken to court by the Amanresorts in Bali for violation of “well known mark” over the use of the “Amanusa” name. In terms of facilities, there is really not much to shout about, which is typical of cluster-housing developments. You get a 20m lap-pool, steam bath/gym and 2 carpark lots per villa in the basement. Visitors will have to find their own roadside parking along Grace Walk. The bungalow villas come with your own private pools on the ground level, while all the Semi-D villas have a 13m lap-pool on their rooftops. Each villa also comes with your own home lift, which is handy for those who are not particularly enthusiastic about stairs-climbing. The “built-in” area in each level of the Semi-D villa is supposedly 13.5m x 5m, which gives you about 730sqft per floor. This area excludes most of the PES space on the ground floor, which can vary quite a bit in size depending on the actual villa you select. We will not elaborate on the villa layouts, as you may see these for yourself in the e-brochure below. There is no “showflat” per se at the sales gallery – what you get is a “representation” of the living/dinning/ kitchen and the master bedroom/bathroom areas, which will give you some idea of the space as well as the quality of furnishing & fittings you can expect to get with your villa. At least part of the Living/Dining area in each Semi-D villa comes with double volume ceiling (6m) and 90cm x 90cm large marble-slabs flooring. The dry kitchen top is equipped with its own induction cooker and hood. The wet kitchen is surprisingly small, with possibly just enough space for two people to work in. “Scholites” brand hob/hood/oven/microwave are provided, as well as a small single-door “Teka” fridge. The master bedroom looks quite big and has ample wardrobe space. The master bathroom has marble floors/walls, separate tub and rain-shower cubicle, and you get “Duravit” brand bathroom sink/toilet bowl and “Gessi” bathroom fittings. • The “built-in” area for VERDANA VILLAS, if it is indeed 730sqft/floor for the Semi-D villas, is a more accurate representation of the house area you are actually buying as compared to, say, ESTRIVILLAS (reviewed on 27th Dec 2009). There is definitely much lesser of what the wife and I deemed as “unaccounted for” space for the former. • The quality of furnishing and fittings - the large marble-slabs in the living/dining room look really nice, while the master bathroom is also very elegant. • Guests can actually enter your house from the ground level – there is a gate at the PES in front of your villa. Once through the gate, you arrive at a door that opens into the living room. This is unlike ESTRIVILLAS, whereby for most of the units, your guests can only enter your house via the “main door” in the basement or through the back-door in the kitchen on the ground level. • The small wet kitchen, which is a major complaint with the wife as she does quite a bit of “heavy duty” cooking. • Grace Walk is actually a rather narrow road, with a row of terrace houses on the opposite side. So finding roadside parking may be a problem since you have to compete for spaces with the terrace house owners with multiple cars. 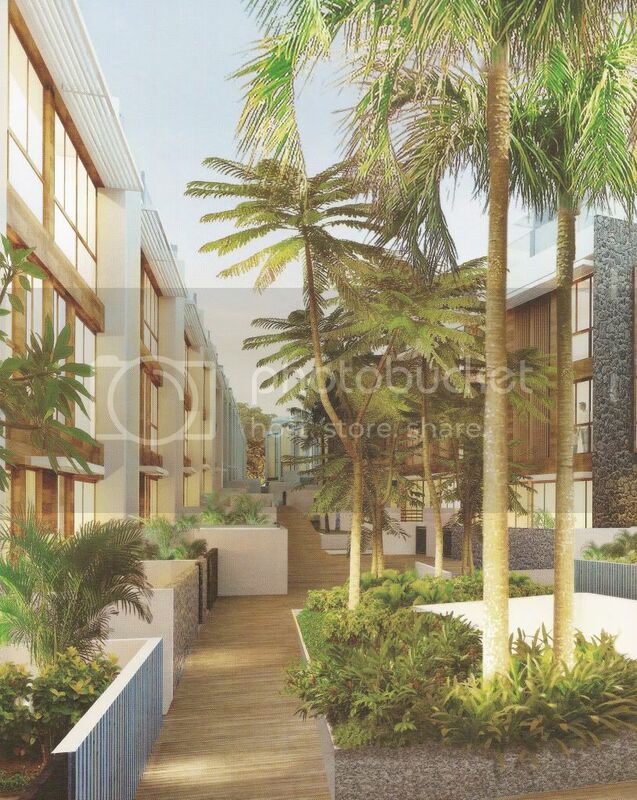 • VERDANA VILLAS is marketed to be within close proximity of amenities, e.g. Chomp-chomp, Lorong Chuan MRT and the upcoming Nex Mall – which is supposed to be the regional mall in Serangoon Central. But as far as we are concerned, none of these are really within comfortable walking distances from the development. So you risk getting a heat stroke or drenched if you intend to walk to these places. Your nearest “supermart” is probably the CALTEX station across the road from Lorong Chuan, which also sells “Old Chang Kee” curry puffs. • Traffic along Lorong Chuan/Serangoon Garden Way during rush hours can be a nightmare, while your most direct access to the city/CBD area is via the CTE. And you probably know by now how much the wife and I “love” the CTE. • The only primary school that is within 1-km of VERDANA VILLAS is CHIJ Our Lady of Good Counsel – not much of a choice and none for those with boys. As of yesterday, 20 of the 56 villas in VERDANA VILLAS have been sold. This includes one of the bungalow (9128sqft). With regard to price, this varies slightly depending on the actual unit you are interested in. As an illustration, the Semi-D villa #33, which is 4456sqft, will cost you $2.96 million. This translates to around $664psf. In summary, the wife and I believe that VERDANA VILLAS is an “acquired” taste - the development will probably appeal most to those who are already living around the Yio Chu Kang/Serangoon/Hougang area. And until they do something about the unpredictable nature of traffic on the CTE, we will probably give it a miss. No Comment to " VERDANA VILLAS (Review) "